The Consortium for Catastrophic Injury Monitoring in Sport (Consortium) was created to develop a stronger national active surveillance program to improve reporting and monitoring of these catastrophic sports injuries. The Consortium was created by partnerships between NCCSIR and several different intuitions and programs. 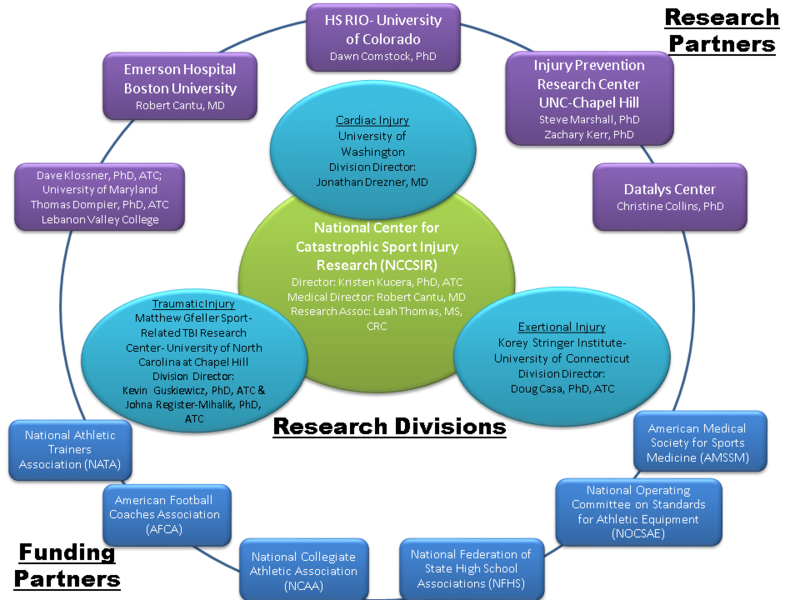 It is divided into three research divisions – Division on Traumatic Injury at The University of North Carolina at Chapel Hill, the Division on Exertional Injury at The University of Connecticut, and the Division on Cardiac Injury in Sport at The University of Washington. There are five Consortium research partners—Boston University, Datalys Center, the High School RIO:Reporting Information Online at The University of Colorado, the Injury Prevention Research Center at UNC-Chapel Hill, and the University of Maryland. The activities of NCCSIR and the Consortium is funded by five national organizations — including the American Football Coaches Association (AFCA), the National Athletic Trainers’ Association (NATA), the National Collegiate Athletic Association (NCAA), the National Federation of State High School Associations (NFHS), the National Operating Committee on Standards for Athletic Equipment (NOCSAE), and the American Medical Society for Sports Medicine (AMSSM).